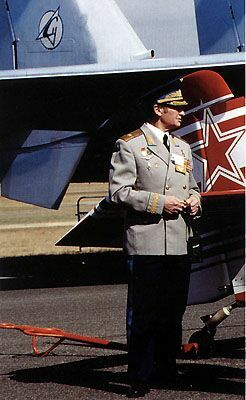 "Pugachev's Cobra" lives in the world of aerobatic maneuvers at the level of such well known maneuvers as the "Nesterov loop" and "Kvochur's bell." This maneuver, during which the airplane, quickly having rolled out to a great angle, executes a straight-up maneuver, having been frozen in the air for several seconds. Viktor Pugachev is a legendary airman, the holder of this particular piloting trick. Honored test pilot, Hero of the Union, he has been working more than a decade at the Sukhoy firm. Test pilots Viktor Pugatshev in the Su-27 and Bland Smith in the F-16C preparing for their demos during the 1989 Paris Airshow. How did the idea to do the "cobra" arise? It was in 89, when the task was placed before the Sukhoy firm to demonstrate Su airplanes for the first time at the international salon in Paris. Before this we, essentially, had not participated in salons. On account of secrecy being closed up - the "iron curtain" then only was beginning to open slightly. And previously only civilian firms represented our country at air salons? That's right - Tupolev, Il'yushin, and Antonov. 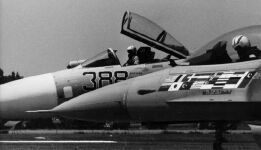 The Su-25 and Su-27 have flown at Le Bourget - we already had learned these airplanes well. I had tested them in a stall and a spin. We had research large angles of attack for control of a spin, for pulling out of it. The idea arose to slow the airplane quickly or quickly to turn it toward the enemy in a dog fight. Then it was decided to use an angle of attack of 25 - 30 degrees. We conceived of using the whole 90. And then you increased the angle of attack to 120 degrees, when the fighter departs rearward and freezes and starts to slow down in the air? Yes, a departure to such angles takes place in 2 - 3 seconds. This was already a new direction in the research of the airplane's stability - super-maneuverability. Mathematical modeling had preceded our work and work on the test stands. After which we began to test the "cobra" in flight. So when they gave us the task to get ready for the air salon in Paris, the experience was already there. Who invented such an unusual name for this element of aerobatics? 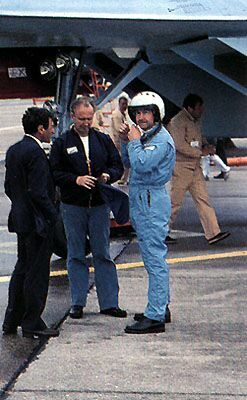 Before the trip to Le Bourget, the Su General Designer, Mikhail Simonov, gathered the team which had been entrusted for the preparations. He said, "Guys, our airplane certainly isn't bad. We can show some find maneuvering characteristics - steep turns, half rolls, turns. But well, aren't we will be able to show something that no other airplane has shown?" What was the most complicated? In view of an amazed public? This was a bit later. Before it reached the public, I had executed a thousand such regimes for certain. But you don't see it yourself from the side. And well, I had seen it on video tape but still the from the amazed eyes of my friends - it became clear: It looks unusual! How did the first performances go? We executed the first flight - everything came together well. Only there were many questions that arose with the international commission: what does this mean? And at the critique the asked us: "And what in general did this mean?" We explained for a long time: It is a departure of the airplane to 120 degrees. Everyone thought: How can it be to 120? It's dangerous, it may stall! Absolutely not, here are our materials - we have performed thousands of the regimes. But the commission requested a second flight so that nonetheless they could examine this regime in detail. Well, we can execute two, three - however many you want! After the second flight we could see already the amazed eyes of the French aviators and the members of the commission. And the world press? How did it react to your "cobra"? For 2 - 3 days the Western press had to be quiet. Simply because their airplanes couldn't repeat our regimes. The French journalists tried to argue with us: is this necessary? And how dangerous is it - isn't it dangerous? They talked about whatever they liked - only not about the concrete fact. Well, the French consider themselves the legislators of the fashion in aviation. But after a few of General Designer Mikhail Simonov's press conferences the started to call things by their own names: The Su firm is a favorite of aircraft construction! Why do you need super-maneuverability? What does it give you in a dog fight? WIth the help of super-maneuverability it is possible to frustrate the enemy's attack. In that our Su frustrates a cannon strike - it is 100 percent! Today the design of the Su-30MK airplane makes victory possible in the very first attack! 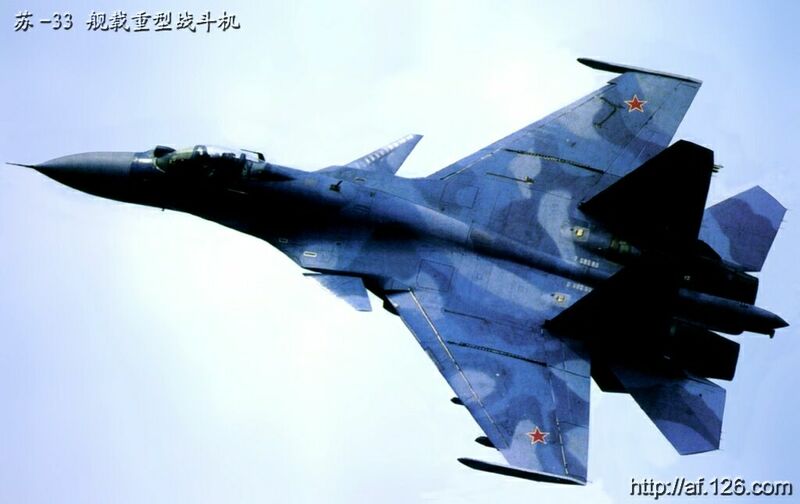 Not one airplane in the world today can execute the regimes of the Su-30MK! But perhaps the West just has another tactic - no dog fights, but bombing at high altitude and departing? In my opinion, the interception of attacking and defending airplanes is inevitable. Yugoslavia provided such an experience, by the way, in which a stealth airplane was shot down. It was shot down only because of the fact that it turned up not far from a MiG-29. The newest airplane was lost in particular in close combat. Yes, the times for this program were fantastic - in 1983 our firm started to develop the research and as early as 1987 we had flown the first ship-based airplane. There were two processes on-going at the same time: the research and tests of the deck-based airplane and the construction of the aircraft carrier. But our navy didn't know such ships before that time. We had seen them only in Hollywood's films. The Nikolaevsk shipbuilding plant built the first domestic aircraft carrier. The task was unprecedented: To design and build immediately several such ships. Were you able to be first to test the new ship-borne airplane? We got a log of flight experience on the airplanes - the flying laboratories. Finally, in 1998 the first airplane was ready. And the first aircraft test left for a trial run. And right away, in 2 weeks after the ship left, we made our first landing on the aircraft carrier. It carried the name "Tbilisi" at that time. And what is it called now? The "Admiral Kuznetsov." As early as 1991, the aircraft carrier completed its first trip to the Mediterranean Sea, having on board 20 airplanes and a fully trained squadron of carrier airmen. During the 3-month trip the demonstrated brilliant combat skills. The first prominent shipborne airman of our country, Timur Abakidze, led this operation. Yes, several years for such an operation - it is moments. Such a thing became possible thanks to the astonishing intellectual potential of all participants of the project. The business was laid out so that all the designers, factory representatives and associates of the serial plant were gathered in one place. Everyone was concentrated at one military base. And with all that strength made the time for the output of the product unprecedented - even for a land-based fighter twice as much time is needed. And again: non-standard methods were used by the developers literally for everything. In what way? Inasmuch as many institutes were present for the tests, an ocean full of resolutions were required, and of agreements. And it already was November: fogs, rains. And there were three men - Su General Designer Mikhail Simonov, the Director of the Nikolaevsk Shipbuilding Plant, and a representative of the acceptance commission on the ship, an admiral in rank, literally in several minutes, at a dining room table, accepted the resolution and signed it. The contents are simple: The ship is ready to receive an airplane on-board.  And I was in the air at this time, involved with tests. And I received a command by radio from the flight director: "We are operating full up! And this meant: landing permitted, get ready to land. This decision was executed in the next approach. Viktor Georgievich, does the ideal of an airman exist for you? Perhaps, not an airman, but a man. Everyone of us has people from whom you learn thoughout life. For me this is Vladimir Il'yushin, whose 75th birthday we observed recently. I have lined up every day according to him and I asked myself: and how would Il make this flight? He has helped me in many serious, complex situations. I often recall his words: "One needs to fly not by using the hands, but by using the head!"